WhatsApp is the most used application in the world and we are ready to bet on it, maybe with a Resorts online casino bonus code, that it will continue to hold this leadership position for a very long time. It may not be the best app but it easily allows you to stay in touch. However, what really makes the difference are the features that over the years the developers have added to this application: calls, video calls, the ability to send photos and videos, and much more. Anyway, it is also fair to admit that in some respects programmers are lagging behind the competition. One of these is definitely the Dark Mode, a feature that allows you to change the colors of the application, using black as a base. Dark Mode has several benefits: it doesn’t tire your eyes when you use your smartphone at night and above all, it reduces battery consumption. This second feature, however, only applies to OLED screens. 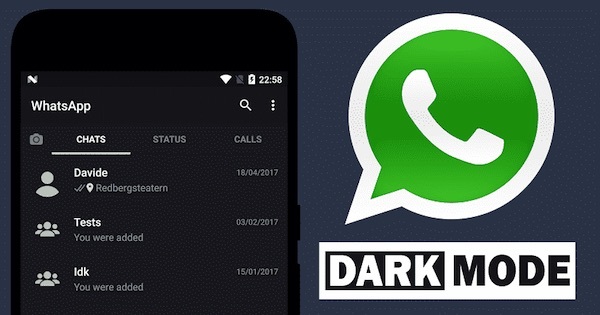 After the delay, the developers finally started to develop the Dark Mode and released it within the beta version of WhatsApp for Android. The first images of the Dark Mode have also been published on the web. This feature has been integrated into version 2.19.82 of the WhatsApp beta for Android and to activate it you need to access the Settings. From the photos, you can see that with the Dark Mode activated, the graphic interface of the app changes greatly. White is replaced by black, and the use of green is reduced to a minimum. When you enter a chat room, black and grey are the predominant colors. At the moment WhatsApp’s Dark Mode is still being tested and it is not known for sure when it will be released on the official version. If all goes well, Dark Mode will come very soon for both Android and iOS. The other novelty in Android’s latest beta is fingerprint authentication. According to what is reported in the network, when this function is enabled, fingerprint unlocking can be enabled or disabled according to user preferences. Just go to Settings, then select Account and finally Privacy. Certainly, this is interesting news and it was expected by millions of users. Nevertheless, an even bigger project that Facebook is working on remains in the background: an integrated platform for Facebook itself, Whatsapp, Messenger and Instagram. Users will be able to communicate with others regardless of the app they are using. If, for example, you get in touch with a brand on the photo app, you can decide to talk to them via Messenger, from where you can also pay if you want. The intention is to include even short messages, only on Android and looking at the new Rcs protocol, a sort of enhanced texting feature to enjoy the same features of web messaging. Zuckerberg also aims to encrypt all communications, as already happens on Whatsapp, but he realizes that he has to find a balance with the need not to become a highway for intruders and a target for law enforcement (see the old battle between Apple and San Bernardino). It won’t be tomorrow or even after tomorrow, but this seems to be the not too distant future we’re going to face.